But hate frying it up in a pan and dealing with flying and popping grease mess everywhere. For years now I had been buying the super duper size of Hormel cooked bacon at Sam’s. It was pretty good bacon and all you had to do was pop it in the microwave for a few seconds and you had instant bacon. Problem was, it could be a tad bit expensive and it was getting where Sam’s wasn’t carrying it all the time. I needed a solution. I can get nice thick bacon at Publix quite often for buy 3 get 1 free deal and with coupons, it really makes it a great deal. 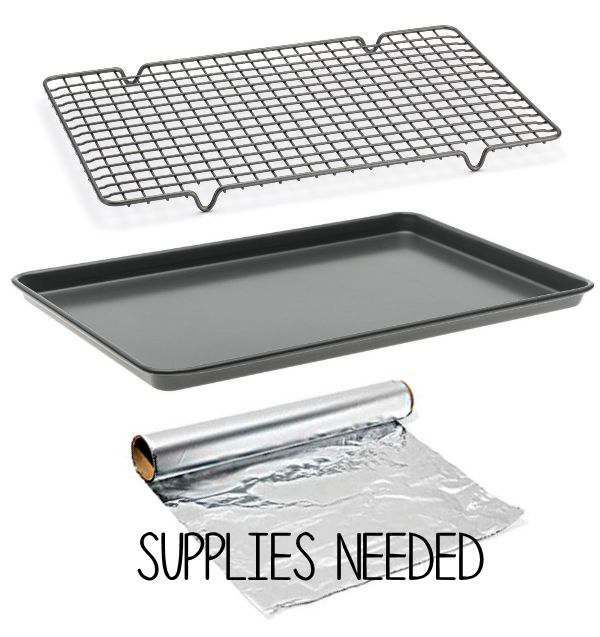 I start off with a sheet cake pan , foil and cooling rack . Cover as much of the cake pan as you can with the foil. It will make clean up much easier. Even though my cooling rack is non-stick, I still spray it with a non-stick spray. Lay out the bacon as close as you can get but not overlap each other. They do shrink. 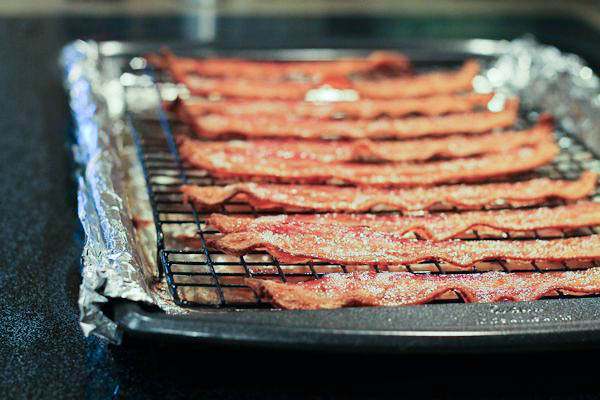 Bake for 20 minutes for thin bacon at 400 degrees. If you have thicker bacon, bake for a couple more minutes. Times can vary depending on the thickness of your bacon, so start watching at about 15 minutes until you get the perfect amount of time. 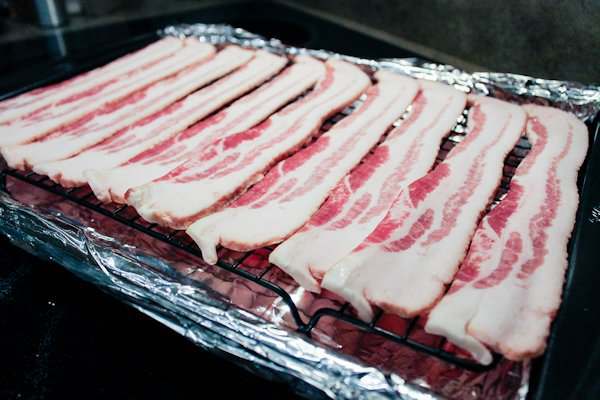 Baking the bacon on a rack really makes it much crisper then letting it bake in its own grease. To heat up, just pop a few pieces in the microwave for a few seconds. Don’t let it cook too long or it will burn. Badly!! Trust me. When its time to clean up, I make sure the bacon grease is completely cooled and then VERY slowly I will pour the bacon grease into an old plastic butter container. Snap on the lid, roll up the foil into a ball and its ready for the trash. Unless you are one who loves to keep their bacon grease for cooking. The pan and cooling rack is easy to wash and put away now. No scrubbing. This process may take a bit of time, but I’ve learned to do other things (checking out what’s going on in the social world) during the baking time. Let’s take one more look at this bacon yumminess. You read my mind. I just visited friends who baked their bacon and it came out so nice and crispy. I decided to try it and here you are with the perfect instructions. I love making bacon this way now. Too easy and really no mess. I hate grease flying through the air. I hope you enjoy and thanks for stopping by. 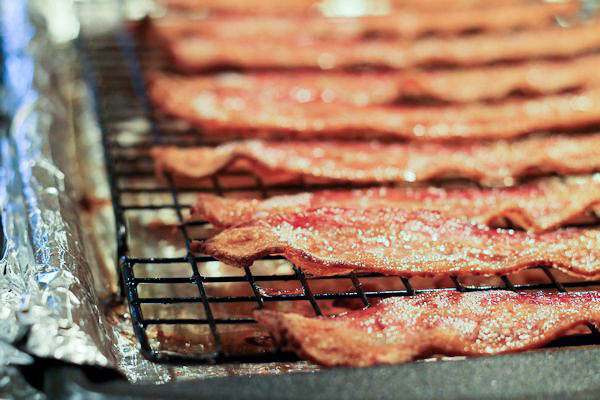 Tammy, like you, I’m a huge bacon fan… and learning to bake bacon in the oven REVOLUTIONIZED breakfast in our home! 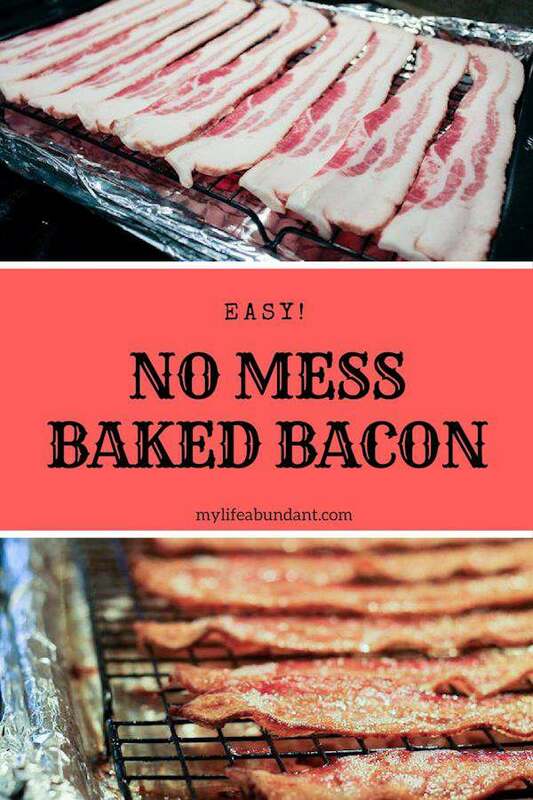 While I don’t make bacon often, it’s a wonderful treat, and not having to deal with the mess it leaves behind when cooked on the stovetop is wonderful! 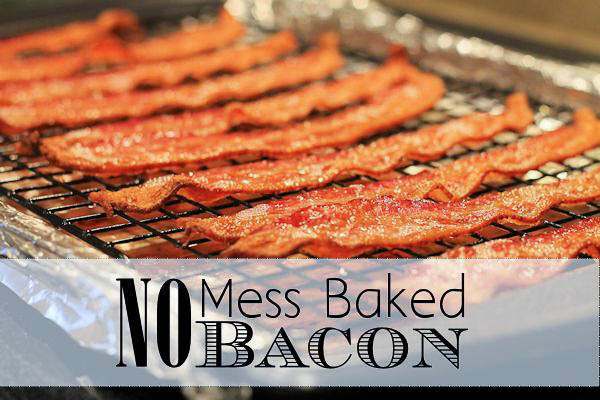 Thanks for sharing this… I hope someone else’s life can be changed by switching to baking their bacon! Now that is interesting! We use the little thing you buy to put in the microwave but it’s not always easy to tell if it’s too long or too short of a time to get the perfect bacon. I will have to pin this and try it! I use to have one of those too and didn’t seem to cook that well either. I’ve been cooking every weekend in the oven, but I haven’t tried it with the rack. Nice idea! The rack really made a difference when it came to it being more crispy. I mean, there still is grease, but not as much. Thanks for stopping by. I am a notorious bacon burner! I fry it on the stove-top, it burns, I bake it in the oven, it burns about half the time… I usually cook it in the microwave between paper towels so it doesn’t burn (usually only takes 3-4 minutes for 4-6 slices), but I do like the taste and texture of bacon cooked in the oven-when I don’t burn it! The oven has been the best way for me to cook it too. I’ve never burned it in there yet. Thanks for stopping by. Great idea! This would save me from being popped. I never cook bacon without getting injured. I’ve always wondered how to bake bacon! Going to try it this weekend. Thanks! Bacon! We love bacon except for the mess from splatter. I do mine the same way,except I never put a rack underneath–I’ll have to try that next time. Thanks for linking up with the Tasty Tuesday’s Link-up. I have pinned your post to the Tasty’s Tuesday’s Pinterest Board!